Gold on Wednesday enjoyed its best trading day since June 24, 2016 when financial markets were shocked by Britain voting to leave the European Union. The most active gold futures contract on the Comex market in New York touched a high of $1,358.60 an ounce in midday trade, up more than 2% or nearly $30 an ounce compared to Tuesday's settlement after inflation data in the US came in higher than expectations. Volumes were massive with 39.4m ounces of April delivery gold traded by mid-afternoon. US equity and bond markets have been in turmoil with huge swings up and down after employment data released at the beginning of the month indicated inflation may be returning after years in the doldrums. Higher CPI numbers are likely to force the Federal Reserve to pick up the pace of interest rate hikes this year. While the price of gold usually has a negative correlation to interest rates as the metal provides no yield and investors have to rely on price appreciation for returns, gold is also seen as an effective hedge against faster price growth and weakening currencies. The US dollar dropped back on Wednesday and is now down 12% over the past year against the country's major trading partners. The yield on US benchmark 10-year Treasurys rose to a four year high of 2.9%. 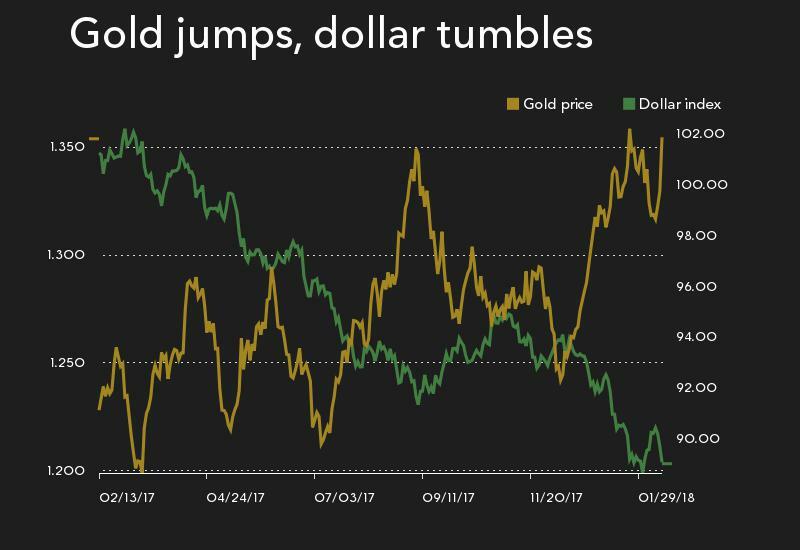 Gold has gained $112 an ounce since mid-December and despite culling positions in recent weeks large-scale speculators on derivatives markets like hedge funds have nearly doubled net long positions – bets that gold will be more expensive in future – since then. Retail and institutional investment in gold-backed exchange traded funds (ETFs) have also kept faith in the metal. ETF vaults last week held some 2,250 tonnes or 72m troy ounces, levels last seen May 2013, as investors pile into the commodity seen as a safe haven amid turmoil on financial markets. Filings with US market regulators revealed on Wednesday that Bridgewater Associates, the world’s biggest hedge fund, has raised its stake in SPDR Gold Shares (NYSEARCA:GLD) and iShares Gold Trust (NYSEARCA:IAU), the world's two largest physically-backed gold exchange traded funds, during the last quarter. Combined Bridgewater's holdings of physical gold in the two ETFs are worth just under $650 million. Founder Ray Dalio is advising investors to keep 5–10% of their portfolio in gold as the risk of a US recession within the next couple of years rises. Bloomberg reports the filing showed Bridgewater also boosted its stake in Denver-based Newmont Mining to 148,185 shares, while cutting its stake in Barrick Gold to 160,951 shares. Reuters reports New York-based Paulson & Co kept its stake in gold investments during the fourth quarter of 2017. Led by longtime gold bull John Paulson, the fund kept its stake in SPDR Gold Trust at 4.36 million shares worth some $540 million during the fourth quarter of 2017. Paulson also left stakes unchanged in mining company AngloGold Ashanti though the value increased versus the end of the third quarter. Stakes in IAMGOLD Corp, RandGold Resources and NovaGold Resources were also unchanged. Meanwhile, CI Investments sharply increased its holdings in SPDR Gold Trust to nearly 3.9 million shares worth $482.1 million during the fourth quarter, up nearly three times from its 1.45 million shares worth $176.2 million during the third quarter. It doubled its stake in Barrick Gold Corp to 312,762 shares worth $4.53 million, and increased its call options to 183,396 shares worth $6.78 million. This compares with 166,396 calls worth $6.8 million in the third quarter.